For the past few years I've chosen a theme for my birthday party and made a cake and other treats to fit in with the theme. This year I wanted to make a cake based on a Russian doll, or matryoshka - I've loved them ever since I went to Moscow a couple of years ago and have several things in my house with that design. I also thought it would be a fairly simple but effective design for a birthday cake. I have to give a hat tip to Alys Cakes and Bakes for the design and decorating idea. I also remembered having seen a similar sort of cake in Fiona Cairns' Birthday Cake Book, though the cakes look quite different - Fiona gives instructions for how to carve the cakes so they stand up, and makes a selection of varying sizes (like the dolls which stack inside each other). She also decorates them with a paintbrush and edible colours, but I wanted to make a flat cake and preferred to cover it with coloured fondant. I did use the recipe for the actual cake from the Fiona Cairns book though as I thought it would fit in well with the Russian theme and make a nice change from chocolate. I doubled the quantities below to make two cakes to sandwich together. Preheat the oven to 160C. Break the eggs into a mixing bowl - I was glad to be able to use my KitchenAid as this made it a lot easier! Then beat in the flour, cornflour and salt. Melt the butter and beat that in as well. I decided to cook the cake mixture in a medium-sized roasting pan as I wanted a flat sheet cake I could cut out. It took about an hour to bake - the recipe recommends 50-60 minutes but it will depend on your oven and the size/depth of your cake tin. Here's the cooked cake - just the right size. I then made the same quantity of cake again (as I realised one would not be enough) and allowed them both to cool. I have these three decorative boxes from Paperchase sitting on my bedroom windowsill. I decided to use the large one as a template and cut the cake out following the shape of the doll. I sat the top part of the box on the cake and carefully cut around it. I wanted to use the leftover cake from around the edges to make cake pops like these Russian doll cake pops like these, but I didn't have time. To make the syrup, you can make your own sugar syrup but I managed to get this bottle from Tesco, which was only a few pounds and came in very handy when we made cocktails later! ... and I used bottled lime juice for the syrup as I decided at this point to save the rest of the limes for cocktails as well! I don't have a picture but I just mixed those three ingredients and used a silicon pastry brush to brush the syrup over the top and sides of the cake. I made buttercream by mixing butter and icing sugar then adding a little lime juice and vodka. I spread buttercream between the two layers of cake then a thin coating on the top and sides of the cake. Now for the decorating... I took a block of white sugarpaste - about 200g - and some blue food colouring (I prefer to use gel or paste than a liquid colouring as the colour is more vibrant and it isn't so runny). I kneaded the blue colouring into the sugar paste and rolled it out. I used the blue sugarpaste to cover the bottom two-thirds of the cake, then coloured some more sugarpaste pink and covered the top part of the cake. I cut the bottom of the pink sugarpaste so it would look like the bottom of a shawl around the doll's neck - you'll see what I mean later. This is a cute little mould I bought over the internet, intending to use it for another cake, but I realised it would come in handy here. I pressed a small piece of the leftover pink sugarpaste into the mould to make a mouth. I wanted to decorate the bottom part of the doll - her dress - with flowers. I have a set of different-sized cutters and used yellow and white sugarpaste for contrast. I stuck the flowers on with edible glue. I cut out a circle of white sugarpaste for the face, and made cheeks and eyes out of small pieces of sugarpaste, then added the lips and some hair. I also found some Russian doll ribbon on Ebay and bought a length, which I put around the bottom of the cake. It tasted delicious - really light and the flavour of the lime came through with a more subtle hint of vodka. I was really pleased with the way it turned out! This month's No Waste Food Challenge has using up leftover spirits and cordials as its theme, and while that's not why I made this cake, it does use vodka and I guess if you had a bottle knocking around in the cupboard and couldn't think of anything to do with it* you could make this cake! *Or if you want a better idea of what to do with vodka I'll be posting some cocktail recipes soon! 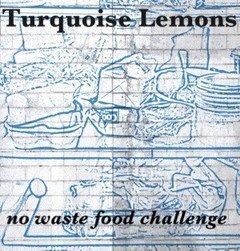 The No Waste Food Challenge is hosted by Kate at Turquoise Lemons. Belated Happy Birthday Caroline. The cake looks fantastic and the flavours sound rather good and very suitable to a birthday celebration. looks very nice,unusual design. as i love vodka,i would have put a lot more in the cake!! Belated Happy Birthday! What a pretty cake and I do love the boxes you modelled it on. I'll have to check out this recipe as I have the book but have obviously overlooked it - it sounds great. Caroline this cake is so fun! I am bookmarking this for my sister's birthday cake next year she would love the combination of vodka and lime. What a find with that ribbon! Thank you so much for entering the No Waste Food Challenge.